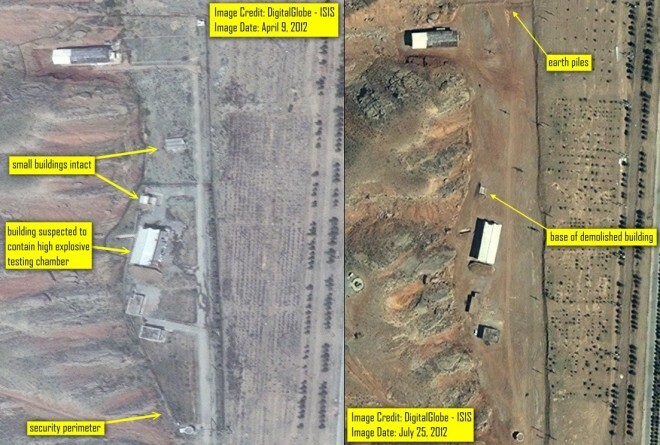 Four months ago, a satellite spotted water flowing from a suspected Iranian nuclear weapons site. The group of ugly buildings nestled near the Parchin military base looked like they were being washed, and watchdog groups thought Iran may have been trying to scrub away evidence of a secret weapons program. Iran had twice refused international inspectors access — inspectors who long suspected it was a secret location to test explosives useful for a nuclear bomb project. Now there’s new imagery revealing Iran has been at work tearing up the place. The image also lands during U.S. Defense Secretary Leon Panetta’s visit to Israel, where the Pentagon chief had to strike a delicate balance between being tough on Iran and leaving room open for diplomacy. Panetta wouldn’t rule out a military strike against Iran, but said the result of the sanctions ”may not be obvious at the moment” and are making a “serious impact.” To stress the point, the White House moved Tuesday to tighten sanctions against Iranian surrogate banks in Iraq and China. The questions over sanctions and whether to strike, though, revolve around suspected weapons sites like Parchin. The evidence for a nuclear weapons program at Parchin is circumstantial, and the strange activity makes it difficult to tell whether Iran is dialing back a nuclear program or shunting its parts to other secret sites. And odd activity around suspected weapons labs may add pressure to keep the sanctions going. Lingering questions over such sites will also determine whether the U.S. launches another war. The new image, released Wednesday by the Institute for Science and International Security (ISIS), a think tank based in Washington, and satellite firm DigitalGlobe, shows a decent amount of work done tearing the place up. It’s largest buildings are still standing, but it’s the kind of activity that made the International Atomic Energy Agency (IAEA) want to take a closer look. The IAEA noticed Iran began cleaning the site after the agency first brought attention to the facilities in November. The IAEA was concerned the large building in the center may have contained evidence of an explosives testing chamber, which can assist in nuclear weapons research. In April, months after the IAEA asked Iran to allow its inspectors to take a closer look, ISIS and DigitalGlobe detected a stream of water. It was coming from the building. Still, in the absence of evidence, the burden of proof is on you. “I totally refute such accusations … nobody can clean any nuclear contamination,” Ali Akbar Salehi, Iran’s foreign minister, told Reuters. Which is not exactly true — it’s just really difficult. There’s no indication any nuclear fuel testing is being done at Parchin. The concern is that Parchin was at one point a lab for explosive tests. Though, it’s a possibility uranium used in tests could still be detectable at the site even after cleaning and bulldozing the environment. And it’s not that the Obama administration wants to start a war over it, provided Parchin is what the IAEA thinks it is. Panetta stressed leaving the diplomatic option on the table while threatening the stick if diplomacy breaks down. “The fact is that [Iran has] expressed a willingness to try to negotiate … And they continue to seem interested in trying to find a diplomatic solution,” Panetta said. If that doesn’t work, the Navy is beefing up its presence in the Persian Gulf. Former and current White House terror analysts are warning that the covert war with Iran might soon turn hot. And the Air Force now has a ginormous new mega-bomb capable of blasting deep underground. They still may not be enough to destroy Iran’s facilities. But you probably wouldn’t want to be sitting in an active Iranian nuclear testing site if the U.S. started lobbing giant bombs at them. Don’t count it out. Strange buildings suspected of containing a nuclear program have helped start wrong-headed wars before. And if Parchin stays quiet, it’s a sign Iran’s leaders may happen to be smart enough to complicate a potential strike by moving their bomb materials around.